From the BBC1 presenter and bestselling author of Eat, The Kitchen Diaries and Toast comes a new book featuring everything you need for the winter solstice. 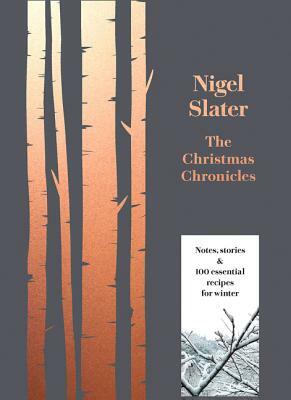 The Christmas Chronicles is the story of Nigel Slater's love for winter, the scent of fir and spruce, ghost stories read with a glass of sloe gin, and beeswax candles with shadows dancing on the ceiling. With recipes, decorations, fables and quick fireside suppers, Nigel guides you through the essential preparations for Christmas and the New Year, with everything you need to enjoy the winter months. Taking you from 1 November all the way to the end of January, The Christmas Chronicles covers everything from Bonfire Night, Christmas and New Year to Epiphany. Throughout the season, Nigel offers over 100 recipes to see you through the build-up, the celebrations and the aftermath. Here are much-loved classics such as goose and turkey (and making the most of the leftovers), mincemeat and the cake; recipes to make the cold months bearable, like ribsticker bread pudding with Comt and Taleggio, salt crust potatoes with blue cheese and goat's curd, and hot-smoked salmon, potatoes and dill; as well as bright flavours to welcome the new year, including pink grapefruit marmalade, pear and pickled radish salad and rye, linseed and treacle bread. Packed with feasts, folktales, myths and memoir and all told in Nigel's warm and intimate signature style, The Christmas Chronicles is the only book you'll ever need for winter.